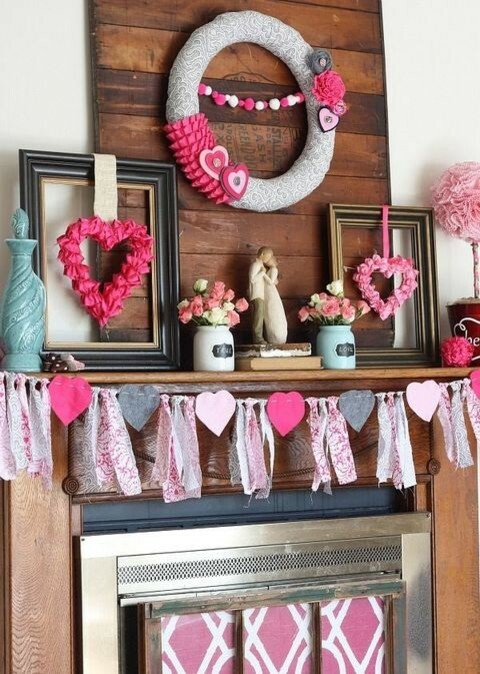 These five mantels are beautifully decorated in a variety of ways for Valentine’s Day – although they all feature banners that could be made at home. This symmetry of this mantel is quite appealing, from the plates above the mirror to the way the banner is hung. 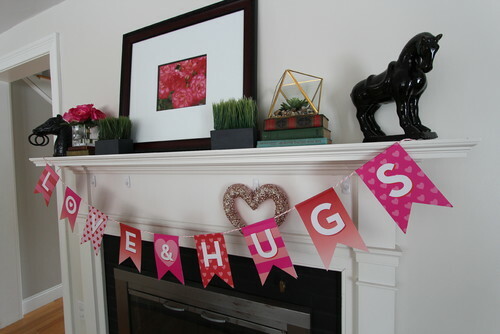 Additionally, this mantel looks like it is perfectly set up to be decorated for any season or holiday: The stand holding the LOVE sign could just as easily hold a sign for summer or Christmas, the tulips could be swapped out for evergreen branches or sunflowers, and the heart wreath – well, you get it. The red and pink colors could be overbearing if your style is less bold, but with the incorporation of white and silver, this mantel has a softer romantic look. Sticking to one shade of red decor will fully flesh out the richness of the color, although be sure to incorporate a couple of neutral items (like candlesticks or a sculpture) so that each candle, heart wreath, banner and candle can catch the eye. 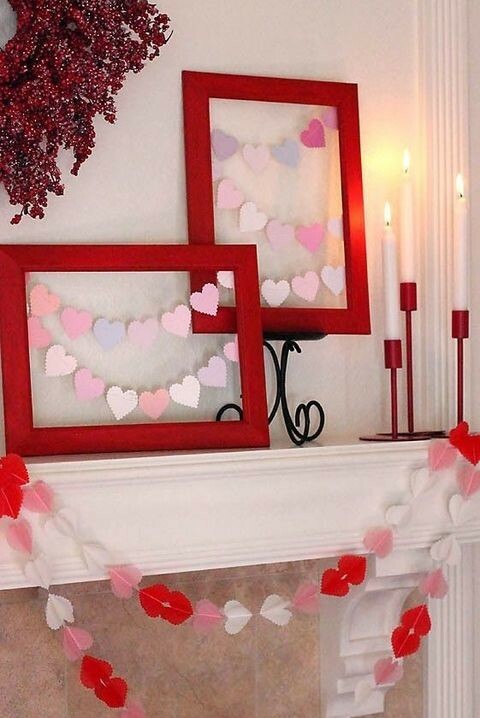 The way the soft colors of the hearts are framed – by a bold red – makes them really stand out and command attention. 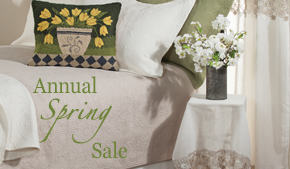 The way they are arranged – as banners – makes them charming complements to the main banner stretched across the mantel. If you want less fuss, a banner like the one below will make a big enough statement to charm you for Valentine’s Day. 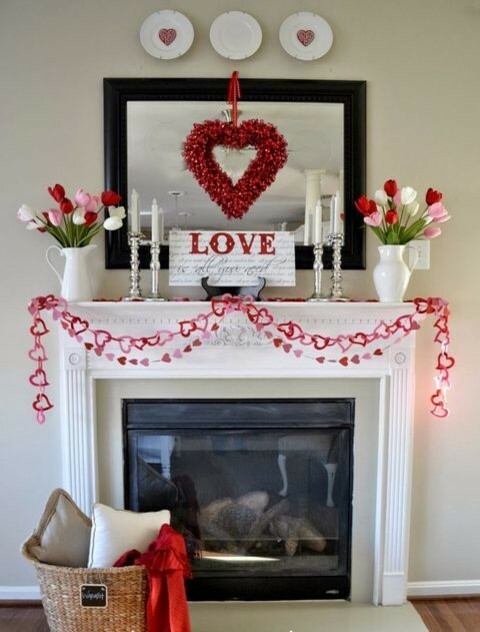 Adding a vase of flowers or a similarly colored print to the mantel adds more cohesiveness to the space, even if they aren’t Valentine themed. 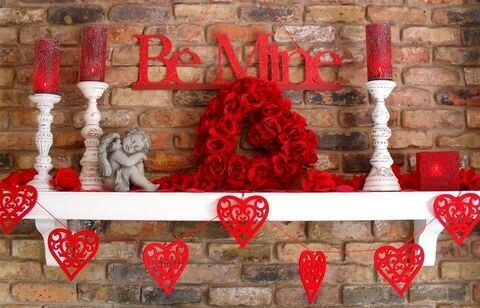 And of course, Valentine’s Day is the perfect holiday to really dress up your mantel for. Add wreaths and flowers among keepsakes and frames – and don’t forget the DIY wreath and banner! This entry was posted on Thursday, January 31st, 2019 at 12:18 pm	and is filed under Crafting, DIY, Decorating, Holiday Decorating, Thematic, Thursday's Theme. You can follow any responses to this entry through the RSS 2.0 feed. You can leave a response, or trackback from your own site.